"Although the Great Pyrenees may appear reserved in the show ring, any sign of excessive shyness, nervousness, or aggression to humans is unacceptable and must be considered an extremely serious fault." A well-balanced, confident Great Pyr is not aggressive, but will be protective of his flock or family when necessary. Confidence in animals as well as people eliminates any need for aggression. So why do we hear of Great Pyrenees Mountain Dogs who are aggressive? There is no doubt that some Great Pyrs can be aggressive. Just ask anyone who has done any work in rescuing Great Pyrs. Let’s face it… this is a big, willful, powerful dog that is bred to take control and protect. But the Great Pyrenees temperament quality we are looking for is confidence… not aggression. How do we prevent Pyr aggression from developing? The simple answer, if there is one, is proper breeding, training and socialization. But even well-bred Great Pyr puppies with great temperament can become aggressive Great Pys if not trained and socialized properly by many many different people. The first 13 weeks of the puppies life is critical in the early stages of its development. This is the beginning of learning to be a social canine. In order for the puppy to go on to continue to be a good canine citizen, this socialization and training is imperative for the next three years. Please refer to the article by Ian Dunbar in Dog Star Daily on Puppy Personality Development. And what makes a Pyr different from most other dogs? The Great Pyrenees was bred to be free thinking, in charge of his own actions, and responsible for the lives of other living things. You cannot change the basic nature of a Great Pyr. Any Pyr owner who does not understand this is headed for trouble and should consider another breed that meets their wants. You have to accept the traits you don’t desire to enjoy the ones you do desire. And there are many desirable traits. Anyone who has lived with a Pyr for any reasonable period of time will tell you about this breed’s amazing ability to sense things that we cannot. A Pyr connects to your soul and reads your emotions and intentions in a way that will amaze you. This ability to “read” is imperative in the early detection of any threat. It also shows up in how a Pyr selects to whom it will pay special attention, whether animal or human. To ensure a Pyr receives the best possible start, it needs to be exposed to everything it will be expected to tolerate in its day-to-day life. A pyr responds very well to a level of guidance that is gentle and consistent, yet firm, to learn to accept these things. This is not a task to be treated lightly. But it is a task rich in rewards, one of which is a very special relationship with your Great Pyr. 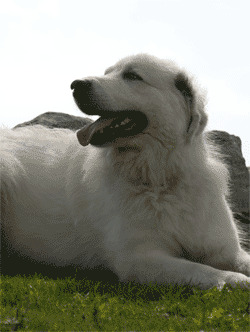 Do you want your Great Pyr to behave in a way consistent with typical Great Pyrenees temperament? Of course you do! So training is critical. Although obedient, Great Pyrs are not renowned for their obedience work. They respond, but still manage to march to their own drummer. So your patience will be tested. This is because man bred them to be independent thinkers in order to watch over their livestock without human intervention. Great Pyrs respond well to encouragement and positive reward… not so well to aggressive training and punishment. In fact, not well at all and can result in an aggressive dog with its aggression based in fear. with Pyrs in particular. Not that it is impossible, but it is good to know what to do with this breed. That is why Positive Reinforcement Obedience Training for a Great Pyr puppy is critically important. In addition, we highly recommend the book “Training Your Pyr Puppy” by Sandra Young as a great source of real life, first hand experience, with Great Pyrs. It provides great common sense guidance on getting your Great Pyr puppy off to a wonderful start and letting all of the wonderful characteristics of the Great Pyrenees temperament shine. Now that we have covered breeding and training, what’s next? Socialization is the third leg of this three-legged stool upon which a beautiful, well-behaved, confident, non-aggressive Great Pyr is based. Once again this is critical in the first two or three years. A developing Great Pyr must be exposed to people and other dogs and animals regularly to become a well-balanced, confident dog. There is simply no other way. Take every opportunity to expose a Great Pyr to dogs and people in varied social situations and you will have a Pyr with true Great Pyrenees temperament and the social skills and manners that will make you very proud. But we advise that this be always on leash, unless you are in a well-supervised, contained space with dogs you know. Having your Pyr by your side on leash ensures your dog is under control, and prevents the possibility of nasty outcomes if your Great Pyr should encounter an adversary while off leash. So what do you do with an aggressive Great Pyr? There are a number of things that you do NOT do. Some folks think that if your Great Pyr is a pet and is aggressive in an urban setting, the solution is to relocate the dog to a farm and give him something to guard. WRONG! An aggressive Pyr is just as likely to be aggressive towards livestock as it is to people. Similarly, some folks think that an aggressive Pyr on the farm can be relocated to the tender, patient care of a family off the farm and the problem will be solved. WRONG again! It does not work that way. The best solution for aggressive Pyrs is prevention. Get your Pyr from an ethical and reputable breeder. One who breeds for sound temperament and health. One who socializes their pups endlessly with many many different people. This must be followed by continuous positive-reinforcement training by their people. If that commitment is not made consistently, you will have a problem dog. Not happy for you and not for the dog. Most human aggressive Great Pyrs cannot be rehabilitated. It is not the dog's fault but that of an unethical breeder. This is an open letter to the Sheep Farmers of Ontario. Please read. If you have an human aggressive dog, have a positive-reinforcement trainer and/or veterinarian behaviourist assess your dog to find out if there is hope in rehabilitating your dog. Please read this article on the reality of behaviourial euthanasia. There is no doubt that Great Pyrenees Mountain Dogs are beautiful, intelligent, confident animals. They are also strong, wilful, instinctive guardians. A well-bred, well-loved and -cared for Great Pyr will reward you with its love, protection and its life if called upon to protect you. It is your Pyr’s bond to you based on a great relationship that makes that happen. Who wouldn't want a dog with a Great Pyrenees temperament? Remember that a Great Pyr’s job is to protect you or the flock from any and all predators. Wolves, Coyotes, bears… it does not matter. This dog will defend to the death. It takes a very confident, fearless dog to do that job well; and a Great Pyr does it extremely well. It is in his nature and is a requirement for his survival. Check out this amazing true story. As you can see from the breed standard describing the Great Pyrenees temperament, we do not want aggression in our breed. So the challenge is to provide the teamwork, the social conditioning and the necessary positive-reinforcemen training to promote our Pyr’s full potential to develop its natural confidence and poise. Unfortunately, for Great Pyrs who have not had the proper training and socialization, Great Pyr aggression becomes an unnecessary reality. We wish it were not so. Want to learn more? Jade Hill knows a thing or two about dogs. She has spent years as a breeder, trainer and nutritionist and has developed a special interest in canine nutrition, canine behaviour and learning theory. Here's what Jade has to say about Great Pyrenees temperament and training.